Now it’s my turn to write my thoughts about Imaginaerum. I must say I was among those, who had no problem to accept Anette as new lead vocalist. This time I was looking forward to listening to Imaginaerum even more. Why? I liked the idea of the album and I was eager to hear Anette’s progress. The reviews highlighted Anette’s vocal performance a lot which was a good sign for me. Not that I had doubts but well. Imaginaerum is, as Tuomas calls it, a place where your imagination is being cured. And your imagination will be cured by a great diversity which this album offers. You’ll find folk song, jazz song, epic song, oriental song and many more. When I heard the first single Storytime for the first time my thoughts were just "wow." I still think this is one of their best singles so far. And now happens something I thought won’t ever happen. I actually prefer radio edit over album version. The bridge doesn’t fit the song at all, IMO. Also for the first time ever a children's choir is presented. Slow, Love, Slow is one of the songs I was curious about. I have nothing against jazz in general but I had no idea what to expect from this one. I admit I listened to the samples and after listening to the whole song it ended up on my favourite ones list. The others are Scaretale, Rest Calm, Turn Loose The Mermaids, Last Ride of the Day and Song of Myself. I would love to point out Anette‘s vocals on Scaretale. She just sounds great. She can be an evil witch and in a next minute a seductive singer singing in 1930’s nightclub. I consider Turn Loose the Mermaids my favourite ballad in general. I like Anette's warm, low vocals. Although, the "western" instrumental part with whistling sounded strange at first, I learned to appreciate it. Rest Calm is another favourite of mine. I like the sudden change from heaviness to softness and the combination of Anette and children's choir works great. Last Ride of the Day has catchy chorus and nice fast tempo. My only concern about this song is, if they ever play it live (pretty please yes!) will Anette sound at least decent? I hope so. Song of Myself an epic song with long dragging poem. I must admit I do skip the poem more often than actually listening to it. Yet it is nice to be able to hear Anette’s son, Marco’s twin sons or Tuomas‘ parents and many more recite the poem. I think this song is one of those you have to listen couple of more times to understand why the poem is included. Well now the list of not so favourite ones but still good songs. I really don’t think they are bad at all. It just took me some time to appreciate them. Arabesque is the one I skip all the time. It was composed only because of the film and honestly I don’t care for that song at all. Ghost River is the one I had to force myself to listen to again. I like the dialogue between Anette and Marco. Also "We will go down we will drown drown, deeper down" sung by children's choir is my favourite part from the whole song. Nice dancy song I Want My Tears Back will be played live so I’ll see if it plays a trick on me. Taikatalvi, Birdie song and Imaginaerum are nice ones again and I expect them to grow on me later. 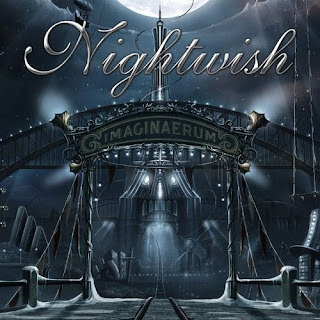 All in all I don’t dare to call Imaginaerum Nightwish’s best album. Although I dare to say it is miles ahead of Dark Passion Play. You have to listen to the album more than just once, though. I personally did it dozens of times. Another thing that little bit bothers me are the bridges on Last Ride of the Day and Storytime. They seem to me so out of the place. But never mind. Lets put it straight again. I love the album much more than Dark Passion Play. I love Anette vocals. Also the booklet seems better to me. Generally, I really am looking forward to seeing them live one day. (Still waiting for the UK's dates to be announced!) AND I hope to see the film this spring. Awesome review Lizzie! I would have to agree with most of what you said on this review, especially the fact that this is much better than DPP. It seems less commercial sounding than the last couple of albums and it looks like they found a good medium in their sound. I actually like the bridge sections that surprise you in songs like "Storytime" and "Last Ride of the Day". No one expects them and I think it is great that NW doesn't stick to any kind of particular formula. I did not know that relatives of the members of NW actually read the poem in "Song of Myself"! Interesting! Another thing. I agree with you on "Arabesque". That track is disappointing for their main instrumental. I was hoping that it would be more like "Last of the Wilds" was; a longer, more NW band involved project instead of hearing a short, Arabic symphonic piece that isn't anything too special. I don't dislike the track, but it seemed like filler to me. I always skip that one like you do. Great review, Lizzie, blunt and honest as usual and fun to read! Thanks! I'm still waiting for my copy to arrive in the mail. Fingers crossed for this week! Thank you. :) Well I tried my best as you can see. Also I keep my fingers crossed for you! There's no better feeling than going through the booklet..and of course its smell of "freshness" lol! I love to sniff to new booklets. Check out Anette's live perfomance of Last Ride Of The Day. It's Flawless!!! It is incredible how much this lady has improved!! !